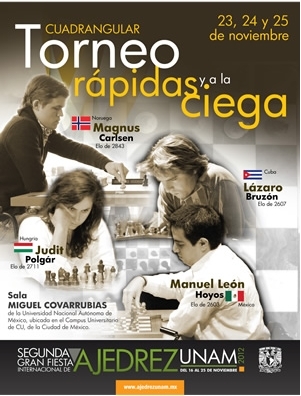 The Segunda Gran Fiesta de Ajedrex UNAM in Mexico City brings us an amazing line-up with Magnus Carlsen, Judit Polgar, Lazaro Bruzon and Manuel Leon Hoyos participating to a "cuadrangular": 4 rounds KO system with the strong brigade playing Rapid and Blindfold games (remember the late lamented Amber event?). 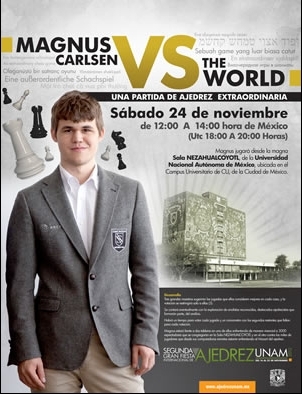 During the UNAM Festival - November the 24th at 1pm ICC time - Magnus Carlsen will be Public Enemy number 1 (!) in the "Carslen vs. the World" game! The Norwegian genius challenges the Internet people, trying to defeat a collective chess brain in this - by now - traditional event. ICC will relay the games and have live commentary in Spanish - with GM Miguel Illescas - for this nice and interesting event. Schedule: Nov.23 and 24th - 6:30pm ICC (Rd 1-2); Sunday 25th - 12:00pm & 6:00pm (Rd 3-4).